Four police forces are to abandon government targets and allow officers to decide whether to make arrests. The "common-sense approach" being tried by the Surrey, Leicestershire, West Midlands and Staffordshire forces has been welcomed by the Home Office. 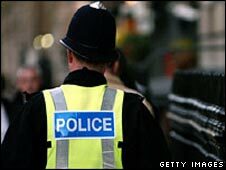 Government targets have been criticised for encouraging officers to focus on minor rather than serious crimes. Surrey police chief Mark Rowley said the public did not want officers to be "compelled" to always arrest people. The schemes follow recommendations outlined in Sir Ronnie Flanagan's review of policing, which was published in February. Sir Ronnie said police did not need to collect the same amount of paperwork for a broken window as a murder. By cutting red tape at least five million man hours - or 2,500 officers - could be saved, he said. These sentiments have been echoed by Chris Huhne, the Liberal Democrat home affairs spokesman, who said national targets have "distorted police priorities for too long, giving as much weight to shoplifting as it does to murder". "Police forces should be able to set priorities and be held to account by elected police authorities who know their area, not out-of-touch Whitehall bureaucrats," he said. Surrey is currently one of the best performing police forces in the country, but Chief Constable Rowley said he was prepared for a poorer performance rating this year. "When the public contact us about minor disputes and incidents, they want practical, common-sense resolutions," he said. "This can range from arrests when a minor incident is the tip of an iceberg, to advice and informal solutions when it is not. "They do not want officers to feel compelled to record all incidents as crimes and to always arrest those involved, simply to hit targets. "I want our officers to apply their professional judgement and discretion to do the right thing." Surrey gave as an example that under current national guidelines, a complaint that a child had damaged a neighbour's greenhouse with a football would automatically result in a criminal damage offence being recorded and an investigation being started. Now, however, "it may be possible to quickly establish that the damage was accidental and the child's family have offered to pay for a repair". "The neighbour's complaint is solved, the child is not unnecessarily criminalised, and the time required for police to complete the paperwork for a crime investigation can be put to better use dealing with other public concerns," it said. I hope the remaining forces realise they are in danger in total collapse of public support, and follow on respectively. The Home Office said it was aware the police forces were about to start pilots "that will enable officers to use their professional judgement to determine the level of detail in recording of crimes". "The aim is to reduce unnecessary bureaucracy, with the agreed principle that all allegations of crime will be recorded to ensure compliance with the national crime recording standards to ensure transparency, integrity and public confidence in the process." The Association of Chief Police Officers commended the government for recognising that the burdens of targets now outweighed some of the benefits.